US Senator Amy Klobuchar entered the 2020 presidential race today, becoming the first moderate in an increasingly crowded field of Democrats vying to challenge Republican President Donald Trump. Ms Klobuchar becomes the fifth US senator to announce her candidacy, and the fourth woman in the chamber. Ms Klobuchar, 58, now in her third six-year term as a senator for Minnesota, will seek to position herself as a contrast to Mr Trump, who is expected to be the Republican candidate in the November 2020 election, focusing on both policy differences but also style and tact. 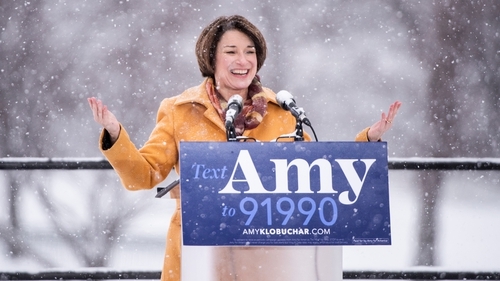 "I stand before you as the granddaughter of an iron ore miner, the daughter of a teacher and a newspaperman, the first woman elected to the United States Senate from the state of Minnesota, to announce my candidacy for president of the United States," Ms Klobuchar said. A large crowd assembled in Minnesota on an island in the middle of the Mississippi River, despite a heavy snowfall and -10C temperatures. Ms Klobuchar's announcement came amid several news reports of high staff turnover in her Senate office with workers complaining of having to do personal chores, making it difficult to hire high-level campaign strategists. A former prosecutor and corporate attorney, Ms Klobuchar joins a list of Democratic hopefuls that includes fellow Senators Cory Booker of New Jersey, Kamala Harris of California, Kirsten Gillibrand of New York and Elizabeth Warren of Massachusetts. Ms Klobuchar gained national attention in 2018 when she sparred with Brett Kavanaugh during Senate hearings on his Supreme Court nomination. Her questions earned her recognition in Democratic circles for working to advance the #MeToo movement against sexual harassment and assault. Ms Klobuchar won her most recent Senate race in November with more than 60% of the vote. But she raised only about $7.4m, a relatively small amount compared with Senate candidates in more competitive races. By comparison, Ms Warren raised $35m in the same period. Ms Klobuchar hopes her moderate policies and strong electoral record in Minnesota will help her win back states Mr Trump took from Democrats in the 2016 White House contest, including nearby Iowa, Wisconsin and Michigan as well as Pennsylvania.